Made from bark of the birch tree, xylitol is a sweetener that gives many sugar-free foods their sweet taste. Because most Americans eat far more sugar than what's healthy, choosing foods that contain xylitol allows you to cut your sugar intake without having to give up all of your favorite foods and drinks. Xylitol is a sugar alcohol that adds texture and bulk to certain types of foods, according to the Colorado State University Extension. Unlike certain artificial or man-made sweeteners, such as aspartame and sucralose, xylitol is a natural sweetener. It contains calories, about 2.4 calories per gram compared to the 4 calories in a gram of regular sugar, according to the Diet Channel website. Xylitol has health benefits that sugar doesn't, too. For example, xylitol can help prevent cavities and gingivitis. Certain sugar-free candies contain xylitol so they have the sweet flavor consumers are looking for, but for fewer calories. According to the Diet Channel website, a variety of candy that would normally contain 100 calories per serving would have about 60 calories instead. Xylitol is present in many candies marketed as being sugar-free, according to Kay O'Donnell and Malcolm Kearsley, editors of "Sweeteners and Sugar Alternatives in Food Technology." For example, sugar-free hard candies, mints and gumdrops can contain xylitol. 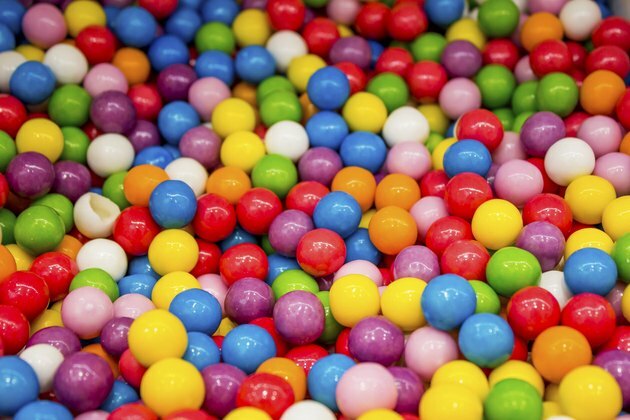 The most common place to find xylitol is in chewing gum. Xylitol has a cooling, almost minty taste, which makes it appropriate for use in sugar-free gums such as peppermint and spearmint flavors. The sweetener also helps manufacturers achieve the soft, flexible texture consumers look for in a piece of gum. Certain types of gums that contain xylitol might also contain other sweeteners as flavoring agents. Xylitol can be present in sugar-free chocolates, according to O'Donnell and Kearsley. The advantage of chocolate products containing chocolate is that they have a similar texture and taste compared to chocolates made with sugar. Desserts marketed to diabetics often contain xylitol, as well. Because xylitol is granulated like regular sugar, it can also be added to homemade baked goods to reduce the sugar content, though the minty taste of the product will change the taste.